The Night Is Coming: In Remembrance of "Dear Doctor Luke." Did Paul owe his life to Luke? If so, we owe Luke our thanks, because it was Paul who wrote most of the New Testament letters and who evangelized the west. Luke is special. Not only was he the only Gentile (non-Jew) to write books of the Bible, he was a close companion of Paul. If Paul succeeded in evangelizing the western Roman empire, Luke may have had more to do with it than we know. It is likely that God used his medical skills to keep Paul alive some of those times when he was beaten, stoned or half-drowned. Luke is special, too, because he is the first Christian physician on record. Untold thousands have followed in his steps. Physicians can look to Luke as an example. But so can historians, because his writings are very much in the Greek tradition. Painters claim him for their brotherhood, too, because tradition holds he painted a picture of the Blessed Virgin which hung in the Santa Maria Maggiore in Rome. Luke pulled back the curtain on the young Jesus more than any other gospel writer. Without him we would know nothing about the boy Jesus's thinking. It is a pretty safe bet that Luke interviewed Mary and got most of the details from her. Perhaps he even heard the Magnificat, recorded in his gospel alone, from her very own lips. 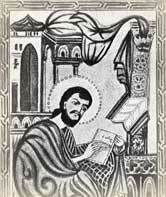 This day, October 18, is the great doctor's feast day in churches that observe such traditions. Aspland, Alfred. The Four Evangelists. Manchester: The Holbien Society, 1873. Barclay, William. The Gospel of Luke. Philadelphia: Westminster, 1975. Butler, Alban. Lives of the Saints. New York: Kennedy, ca. 1956. The New Catholic Encyclopedia. New York: McGraw-Hill, 1967. Fitzmeyer, Joseph A. The Gospel According to Luke. Anchor Bible. Garden City, New York:Doubleday and Co., 1986. Munck, Johannes. The Acts of the Apostles. Anchor Bible. Garden City, New York: Doubleday and Co., 1986. Rohrbach, Paul. Armenmien. Englehorn, 1919. Source of the image. Tenney, Merrill C., gen. ed. Pictorial Bible Dictionary. Nashville: Southwestern Company, 1972. Ramsay, W. M. Luke the Physician and Other Studies in the History of Religion. Grand Rapids, Michigan: Baker, 1956. Scott, John A. Luke; Greek Physician and Historian. Evanston, Illinois: Northwestern University, 1930. Walsh, James A. "St. Luke the Physician," appendix to Old Time Makers of Medicine. New York: Fordham University Press, 1911.